WHAT: The University of Illinois Springfield Engaged Citizenship Common Experience (ECCE) Speaker Series presents “Law Mart”, a discussion of UIS Assistant Professor of Legal Studies Riaz Tejani’s new book. This event is free and open to the public. WHEN: Wednesday, September 13, 2017, at 6 p.m. 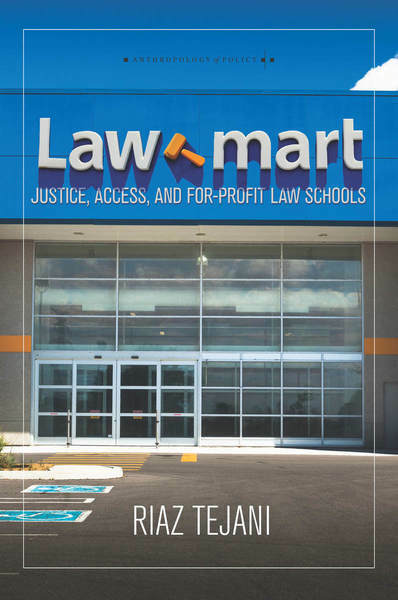 DETAILS: In “Law Mart”, Tejani argues that the rise of accredited for-profit law schools is exposing the limits of market-based solutions for American access to justice. His research reveals how for-profit law schools market themselves directly to enthoracial and socioeconomic minority communities. The schools relaxed admission standards, increased diversity rates, shook up the established curriculum and then watched student success rates plummet, thus creating a law school crisis where enrollment is down and student loan debt is up while the profession’s supply of jobs is shrinking. He questions the need for protections that better uphold institutional quality and sustainability. Tejani is a legal anthropologist with research and teaching interests in legal education, comparative law, finance and globalization and race and ethnic studies. His current research uses ethnographic theory and methods to analyze contemporary changes in U.S. law school governance and organizational culture. His book, “Law Mart”, was published in July 2017 by Stanford University Press.